Metal Slug 7 for the DS lacked co-op, but thankfully the upcoming Xbox Live Arcade version won't. Announced some time ago Siliconera got to wondering just what happened to the game, and whether or not it's still coming. Robert Macchiaverna, Acquisitions Manager at Ignition Entertainment, explained “It is still happening, but I believe that’s scheduled to be a 2010 title.” Ignition published Metal Slug 7 on the DS in North America and has a close relationship with SNK. “Ultimate Match ['98] is coming out this year, but Metal Slug is not,” Macchiaverna continued. Well, we're halfway to 2010 at least. 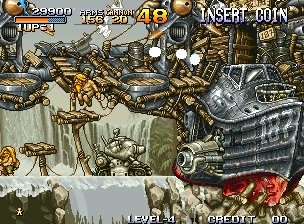 For now Metal Slug 3 will have to hold you over.